Yesterday's iPhone X event saw Tim Cook uttering Steve Jobs' famous words, "one more thing" to a crowd of industry influencers, journalists from around the globe and souped up Apple employees whooping and hollering. It was the third time Cook has quoted those three little words (previously he used them to introduce Apple Watch and Apple Music) and the device that followed may have changed iPhones forever. What came next was, for me, by far the biggest surprise of the entire show. That surprise wasn't the spec, design or features of the iPhone X - that has been leaked consistently throughout the last year - but it was the way Cook pronounced its name. Instead of calling it the iPhone X, Cook said "iPhone 10". He said, "This is iPhone Ten. It’s the biggest leap forward since the original iPhone." Phil Schiller later walked on stage and said it the exact same way. This isn't an interchangeably title - Apple wants you to pronounce it 'iPhone Ten'. Apple's decision to go with 'iPhone X' as the written name makes sense as X is the roman numeral for 10, but I was taken aback by Apple's choice to say the number rather than the letter. That dates the iPhone X pretty quickly. Apple has seemingly skipped over the iPhone 9, and instead we have a range that includes an iPhone 6S, iPhone 7, iPhone 8 and iPhone 10, and that's without mentioning the iPhone SE or the Plus variants. I'm not suggesting there won't be another iPhone - of course there will be - I just don't think Apple will release a device called iPhone 9 in 2018, or ever in fact. The rumors, hype and hyperbole of the next 12 months will likely refer to the phone as the iPhone 9, but maybe Apple will decide to just call it 'iPhone' instead. We've seen Apple subtract the numbers before and it set the precedent earlier this year when it launched the iPad 9.7, rather than calling it the iPad Air 3. The company has made two iPad Pro models with 12.9-inch screens as well, but the second wasn't called the iPad Pro 2. Instead Apple opted to call the second gen model iPad Pro 12.9, and if it makes another in the future it'll likely be called the same thing. So what if Apple adopted this for the iPhone range? You could have the iPhone X sequel phone as the device just called iPhone. You can keep your Plus and maybe even introduce an SE (or perhaps a better name than Special Edition) model around the iPhone name, but you drop the need for numbers altogether. There's always the chance it could go down the iPhone 11 route, but that would also still feel a little strange, considering the 8 and the 10 launched together. 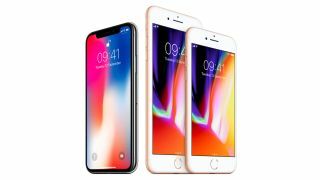 The truth is the new phone will likely be known as the iPhone X, and Apple may well struggle to persuade people to refer to it verbally as the 'iPhone ten'. The vast majority of people who will be buying the phone won't hear how Cook or Schiller referred to it on stage. When it's plastered all over billboards, websites and even in retail stores people will come to know this device as the iPhone X. Whether we'll be set to see an iPhone 9, iPhone 11 or just an iPhone remains to be seen, but I have a hunch it'll be the later when September 2018 rolls around.